In 1998, a young gay man named Matthew Shepherd was brutally murdered in Laramie, Wyoming. This incident increased the conversation about hate crimes and eventually led to changes in legislation (and a really beautiful play). I couldn't help but think about Matthew Shepherd while watching Fortune's Fool Theatre's production of Stop Kiss, which was coincidentally (or not?) written and first produced off Broadway the same year. The defining moment of this play is an act of violence against two women, similar to what happened to Matthew. It's a sweet, funny, and sad play that uses fiction to explore the very real issues of hate crimes and violence against women. 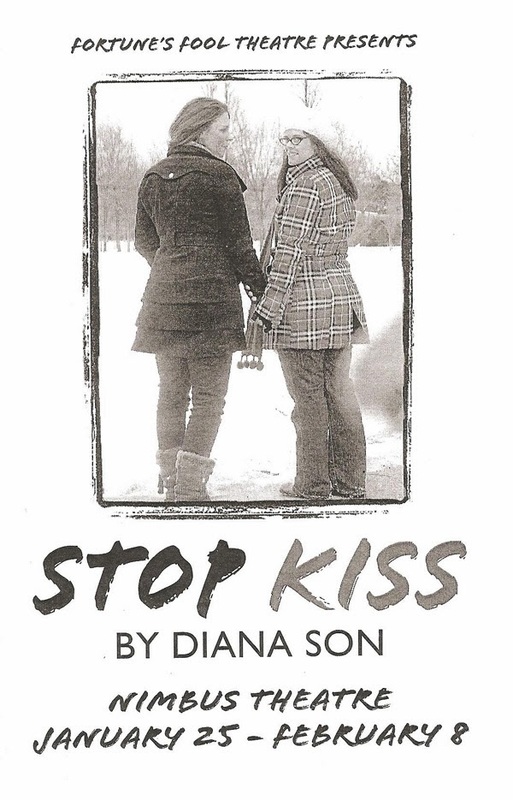 Stop Kiss takes place in the greatest city in the world, New York City, which almost functions as another character. Callie (Ariel Leaf) has lived there since college, when into her life comes Sara (Katie Starks), who has moved to the city on a fellowship to teach children in Brooklyn. Callie shows Sara around town, and the two become friends, and then something more, despite previous (and current) relationships with men. The action of the play flashes back and forth between two timepoints - before and after a pivotal moment in their relationship and their lives. Soon after their first kiss on a park bench, the women are brutally attacked. We see scenes of Callie and Sara getting to know each other and falling in love, building up to that moment, interspersed with scenes of the fallout from the attack. It's quite effective, although the build up seems to go on a little too long (a few of the scenes could have been combined or cut to get to the conclusion quicker). It ends on a sweet note and we never see the violence, but it hangs over the play like a black cloud. The moment that really struck a chord with me is when Sara's ex asks if the man who attacked her was bigger than him, implying that if Sara had been with a man instead of Callie, she wouldn't have been hurt. Firstly, it doesn't matter how big the attacker is if he has a weapon, but secondly, it's sad that we still live in a world where in some places a woman can't walk alone or with other women for fear of being harassed or worse.